The Hopkins Robotics Team participated in the FTC World Championships in Detroit, Michigan, this April. 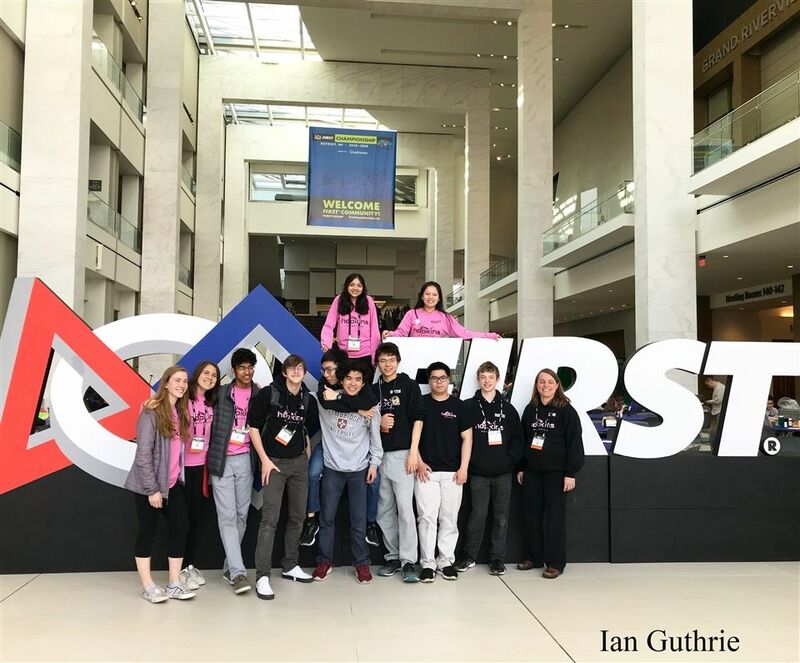 From April 25 to 28, The Hopkins Robotics Team competed at World Championships in Detroit, Michigan. The team’s qualification to the World Championships is an impressive feat to anyone, especially considering the team’s humble starting point. Two years ago, the robotics team was nothing but a Wednesday activity. Led by captains Josh Ip '18 and Liana Tilton '19, the team made its FIRST Tech Challenge (FTC) debut one year ago. At this time, the robotics program at Hop had evolved from this small group to two competition ready teams and a club. Even though the team barely qualified for States last year, the accomplishment marked a significant turning point for Hopkins robotics. This year, with a season of experience under its belt, the team not only qualified for States, but also set a record for its event. The team also won the Inspire Award, a prize given to the most well-rounded team, as well as the Think Award, given to the team with the best engineering notebook. Additionally, the team qualified for the Super Regional Competition, an event in which only three teams from Connecticut compete. The members of Hopkins Robotics tries not only to improve their own skills, but also helps those in the community get interested in this activity. The team, especially the captains, devote countless hours toward outreach programs like Pathfinder to teach robotics to younger children and spark an early interest in STEM. Connelly described the team’s dedication to both their robot and community service: “The best part of the group is the camaraderie between the students and their dedication to the team. The robotics league that we are a part of requires teams not only to build a robot but also create an engineering notebook and provide outreach to the community. Hopkins Robotics has evolved from a small Wednesday activity to a large, serious, and competitive team. For anyone interested in joining a club next year, this club has several outreach programs that allow anyone to experience robotics,including club and rookie teams. The team entered Worlds with low expectations. According to Ben Goldstein ’19, one team goal was to defeat more than 20 percent of its competitors. The Hopkins team ended the tournament with a record of 5-4 earning a twelfth-place finish. In only a year, Hopkins Robotics has bounded from a regional competitor to a Worlds powerhouse. Next year, led by Tilton and Mukherjee, the team hopes to continue their dominant run and to expand their program with new teams, hopefully including the Junior School.